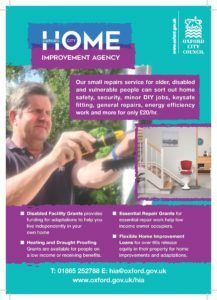 Oxford City Council have launched a small repairs service for elderly, disabled and vulnerable people. The service can sort out home safety, security, minor DIY jobs, keysafe fitting, general repairs, energy efficiency work and more for only £20/hr. Disabled Facility Grants provide funding for adaptations to help you live independently in your own home. Heating and Draught Proofing Grants are available for people on a low income or receiving benefits. Essential Repair Grants for essential repair work help low income owner occupiers. Flexible Home Improvement Loans for over 60’s release equity in their property for home improvements and adaptations.